ADVENTURINE(green) Draws money and prosperity. AMBER -(yellow, orange, brown) Amber has always been associated with magick and is a favorite protective and enhancing stone of Witches and Shamans. It is a sensual, magnetic stone that attracts love. It is said to help draw sickness from the body and negativity from the emotional energy. For this reason, some say amber brings good luck! If you have issues releasing that which is no longer needed, use a piece of amber to help you ease the issue from your spirit. Amber helps clear the mind, gives mental clarity, and will bring inner peace. Beware there are many people selling fake Amber, so here is a simple test. Amber is an electrostatic material (“amber” means “elektron” in ancient Greek). You can rub a piece of amber against fur or pure wool for 10-20 seconds. The electrified piece will attract small pieces of napkin or other light weighted paper. BLUE STALACTITE -(blue) Personal power and direction. Helps with finding and staying on the right personal path. Promotes self-knowledge, centering, connecting to the HIGHER SELF. CARNELIAN -(orange-red) Promotes personal power, strengthened magic, increased fertility or creativity, happy home. Also helps combat the jealousy of others. CHRYSACOLLA -(blue, green) Wisdom, promotes balance and inner peace. CHRYSOPHRASE -(green) Clears blockages in communication, promotes eloquence and persuasiveness. CRAZY LACE AGATE -(brown stripes) Awakens hidden talents and abilities, promotes success in career situations. DIAMOND -(clear) Earth’s hardest stone -promotes personal growth, spiritual lessons, perfecting of self. Also resilience, perseverance, permanence. EMERALD -(light to dark green) Protection, success, prosperity. Also promotes memory, learning. FLUORITE -(comes in many colors) Promotes healing. The focus of the healing may be emotional, physical, spiritual, etc., depending upon the color of the fluorite. 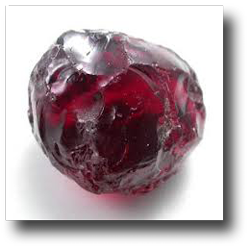 GARNET -(dark red, wine) Garnet is the element of Fire and is associated with the planet Mars and the zodiac signs Scorpio, Capricorn and Aries. GEODE - Fertility, childbirth, meditation, freedom of spirit, psychic ability, dreams, astral travel. GOLDSTONE -(brown with gold flecks) Used to draw money, especially through commerce or the collection of money owed. Goldstone is a synthetic stone, but made with real gold. HEMATITE -(silvery black) Gives protection, absorbs negativity, helps relieve grief or pain. JADE -(comes in many colors, but most commonly green) Serenity, inner peace and balance, good fortune. Promotes the perfection of self, and connection to Spirit. JASPER -(red, brown) Helps promote openness to new ideas and influences, flexibility. LAPIS LAZULI -(dark blue) The incredible golden and azure-blue beauty of lapis lazuli has caused it to be valued for millennia as one of the most sacred of stones. The ancient Egyptias used powdered Lapis as a gorgeous blue eyeshadow. Lapus Lazuli is also known as the 'stone of truth', and can help heal karmic wounds. When used during meditation it will help you to focus your mind. If you suffer from insomnia, wearing Lapis anointed with lavender oil will help you to sleep. If you have trouble speaking from the heart and saying what you really feel, anoint your Lapis with cedar oil and ask for help in expressing yourself. Lapis promotes psychic opening and clairvoyance. LOADSTONE -(black) Lodestone is magnetic iron ore, and are considered a magickal bridge between the realms of stone and metal. Lodestone is very magickal and will attract and draw good fortune, money, success and love. Lodestone is excellent for grounding and protection from evil and spells and will dispel negative emotions such as fear and anger. It also guards against infidelity. Lodestone can align the chakras, and balance yin/yang energies. It is used to lessen or dispel grief, fear, anger, confusion, and attachment. It helps relieve burdens and increase energy and endurance. When used in healing rituals lodestone can draw pain away from the body. Lodestones are considered to have a gender and it’s easy to tell them apart; female lodestones are rounded, male lodestones are phallic. Lodestones are thought to be one of the most “alive” of all the magickal stones. They possess memory, intelligence and consciousness along with wit and a soul. Because of this perception, lodestones must be periodically replenished or “fed” with iron filings, iron dust or magnetic sand. To feed your lodestone first dress it with a magick oil of your choice to suit your desired results, or with pure essential oil, or with whisky then sprinkle the stone with iron filings, iron dust or magnetic sand. If your lodestone is very depleted after being used in extensive spellwork place the lodestone in a glass, stone or metal bowl, then cover it with dirt (crossroads dirt is best) and let it rest for 3 days. Lodestone can be worn as an amulet to attract good fortune, or placed in oil for a period of time to produce Magnetic Oil, which can then be used to anoint candles, charms or oneself to attract good fortune. MALACHITE -(green and black) Malachite promotes success -whether in business or love. Prosperity, creativity, fertility. MARLENITE -(red, red and yellow) Also called “Philosopher’s Stone.” A very strong money stone, this synthetic stone is named for Marlena Berndt, famous metaphysical historian of gems and stones. METEORITE - Meteorites are rocks and metals that have landed on Earth, most are asteroid fragments and a few are from the Moon and Mars. They are gifts from another world, the sacred stones from the heavens. When meditating with a meteorite, visions and information may come to you that are alien or otherworldly. Use meteorite to connect to the Universe, to bring comfort in new environments, for Chakra alignment and activation, extraterrestrial communications, inner visions, and spiritual awakening. Meteorite is also useful in grounding high vibrational states of consciousness. There are two groups of meteorites; melted and unmelted. Unmelted meteorites are made up primarily of stone, melted meteorites are made up of iron, stone & iron or stone. Metal-based meteorites made of a combination of nickel & iron are similar material to Earth’s core. They assist inner stillness, patience and persistence with spiritual growth and soul purpose on Earth. These meteorites, in ancient times, were considered as a prized source of metal for making weapons. MOONSTONE -(milky white) Moonstone holds the power of mystery. It is a talisman of the inward journey, taking one deep into the self to retrieve what is missing, the parts of the soul left behind or forgotten, then brought to light. 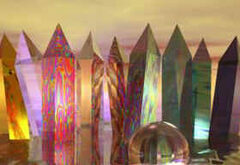 Rainbow Moonstone acts as a prism, diffusing energy throughout the aura. It provides psychic protection, clearing the mind and senses, and aids in lucid dreaming and calm sleep. It deflects negativity and eases emotional trauma. Aligned with the Goddess, Rainbow Moonstone connects with the energies and spirits of Nature. Protection, absorbs negativity, promotes confidence, psychic opening. MOTHER-OF-PEARL -(iridescent white) Deepens emotional commitment, draws marriage, long-term love. OBSIDIAN - (Black) Grounding and protection, wards off negativity. OPAL -(iridescent greenish white with orange, red) Promotes psychic opening and development, sensitivity to spirits. Once considered unlucky by those who feared psychic phenomena. PEARL -(white) Peace, compassion, love. Pearls are said to retain positive emotions incomparably well. RHODOCHROSITE -(pink and gray) Promotes sexual adventure, fertility, pregnancy. RHODONITE -(pink and black) Helps healing of emotional pain, especially from loss of love or loss of a loved one. Helps requite grief, draw new love. Promotes reconciliations of parted lovers or friends. ROSE QUARTZ -(pink) Love, happiness, self esteem. SODALITE - Sodalite is very similar to Lapis Lazuli and is often used in place of it. Promotes psychic development, clairvoyance. TIGER’S EYE -(gold and brown stripes) Promotes popularity, eloquence, persuasiveness. Helps improve communications. Also used for protection in traveling, and for protecting mechanical vehicles. TURQUOISE -(blue) Protection, good fortune, psychic opening. Considered very sacred.